Kelly Lowe is also the author of An Astrologer’s Journey, the nationally reviewed story of how the practice of astrology answered her youthful search for meaning and led her into a career as a well-known astrology counselor. She has taught her workshops all around the country, from Florida to California, and is known for intertwining a deep knowledge of human nature with suggestions for optimal timing according to the movements of the sun, moon, and planets. 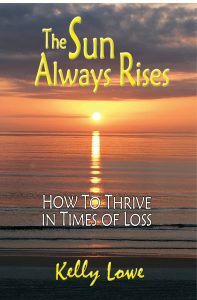 The Sun Always Rises is published by CHB Media, the book publisher headquartered in Daytona Beach. It is priced at $14.99. The book is available for purchase at Amazon.com, and a signed copy right here on AstrologyTalk.com. “An Astrologer’s Journey” is an inspirational and entertaining voyage. You don’t need to be an astrologer or even know anything about astrology to appreciate and enjoy Kelly Lowe’s journey as she shares her secrets of living a happy, fulfilling life. Join Kelly as she travels through thirty years of stimulating life experiences on a journey that carries the reader from her early search for meaning to her calling as a professional astrologer. Along the way, her passion has convinced many others to “come aboard” and make her passage their own. An Astrologer’s Journey is filled with insights into how “living with the stars” can help anyone to sail with a more favorable wind. No, it is not Hemingway but The Sun Always Rises, subtitled How to Recover and Prosper After Loss, is both a personal and universal story of survival and renewal. The author, Kelly Lowe, takes the reader on a remarkable journey, tracing her steps to a bright new life after losing her husband to cancer. She also shares stories of others who have endured and triumphed after losing a spouse to illness or even divorce. The universal thread winding its way through all of these unique stories is the message that losing “the light of your life” does not mean that all light has left the world. Life is always full of exciting possibilities if we will only open our hearts once again and embrace them. The Sun Always Rises is a heartfelt guide to love, loss, hope, and moving on in a guided way. This book is for adults who have lost a loved one, want to support others who have lost a loved one, and/or would like to understand the process of loss and healing. Kelly Lowe is also a seasoned Astrologer adding another helpful perspective on this journey from loss to recovery. Loss is loss. Grief is grief. When someone you loved deeply at one time is taken from you, by any way, the pain feels the same. It hits in waves and there is not time stamp on when you should "get over it". Is there really such as thing as "getting over it?" I would say no. What actually happens is just a better managing of the pain and grief. In time there does come some healing which is a relief from the acute pain... Kelly Lowe titled her book so appropriately, The Sun Always Rises... and life does and will go on.